Large decorative marquetry jewelry box with dome lid and gilded feet. Mahogany box with inlaid mother of pearl and mirror, on small round brass feet. 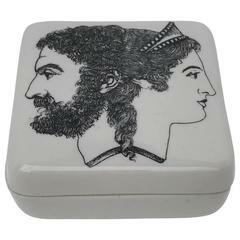 Small Fornasetti box of porcelain with a Janus reference text inside the lid, see detailed image. Swedish 19th century birchwood veneer jewelry box. The box has a heart of brass for keyhole and knob hardware of antler. With tumbling block and star design. Having a hinged top that opens to a fitted interior with tray.